In the stick room that acts as a foyer to the Washington Capitals' locker room at their Arlington practice facility, Matt Niskanen's sticks sit in a stall to the left of the door, No. 2s carefully drawn in black marker on the taped-up knobs. Laying dormant, the defenseman's stick is simply one of dozens nestled into numbered cubbies. In his hands, it is what teammate Jason Chimera recently called "one of the best sticks I've seen for a long time." An active stick, reinforced by proper body positioning and skating technique, is an undervalued skill which Niskanen has gradually cultivated throughout his career. "If you have a tight gap and you're confident in your skating, it's literally just having an extended reach," Niskanen said. "It's kind of an art form where you don't want to have too active of a stick, swinging it around everywhere out of control. It's the timing of when to poke and when to just hold your reach. ...The biggest thing is just having a tight gap with your feet and then having stick on puck as much as you can." When the NHL emerged from the 2004-05 lockout, the league produced a comprehensive set of rule changes that emphasized "entertainment, skill and competition on the ice." There would be zero tolerance on interference, hooking and obstruction. For defensemen, that meant no longer clutching and grabbing opposing forwards in an attempt to stop them. With the speed of the game ratcheted up, being a defenseman required more nuance. "Back in the old days, if you couldn't skate, you could maul your way to being a pretty good defenseman in the league," coach Barry Trotz said. "You still had to have some puck skills and all that, but you didn't have to be the fastest guy. You could still get away with it and be pretty effective. ...The game for defensemen is about being able to skate a lot now." Assistant coach Todd Reirden was actually introduced to the "stick-on-puck" concept several years earlier while playing for the St. Louis Blues in 1999-2000. Coach Joel Quenneville, now in charge of the Chicago Blackhawks, was and still is a proponent of the method, which Reirden later adopted as a pillar of his coaching philosophy. When Reirden's widely recounted partnership with Niskanen began in Pittsburgh four years ago, Niskanen's stick detail was one skill that Reirden felt needed to be honed. Niskanen's skating ability, arguably his greatest asset, allowed him to quickly pivot into position. A smaller defenseman, a more developed stick would assist Niskanen in derailing opponents' rushes. "He's taken a liking to it," Reirden said. "As anything, if you believe in something strongly, you're always going to be better at it. And he now knows that that's a fixture to how he needs to get better and defend and he's quickly climbed to one of the better guys in the league at it." Niskanen studies opposing skaters on video to glean their tendencies. In practice, he mirrors the puck with his stick as he follows forwards up and down the ice. "Just knowing when you have to have an inside stick or when you can be directly on it and have an aggressive stick," Niskanen said, explaining the different approaches to certain in-game circumstances. "Sometimes, a guy is more than 10 feet from you, it's not going to do much good to have your stick straight at him so you might have to back off and kind of try to intercept a pass, whatever it may be. A lot of it is reading situations." Upon being hired by Washington in June, Reirden began underlining stick-on-puck with the rest of his new defensemen, incorporating the technique into practices. One of the more notable changes, according to defenseman Karl Alzner, is the defensemen are encouraged to outstretch their sticks from the outset when defending the rush as opposed to "surprising" opponents with poke checks. "When we're at our best, you can see Capitals defensemen getting a lot of stick on puck, deflecting passes from opponents, just getting a piece of plays, forcing players to make plays sooner than they wanted to," Reirden said. "It's something that's broken down often and some of the things that I think that we'll continue to work on and continue to help us improve as a group." 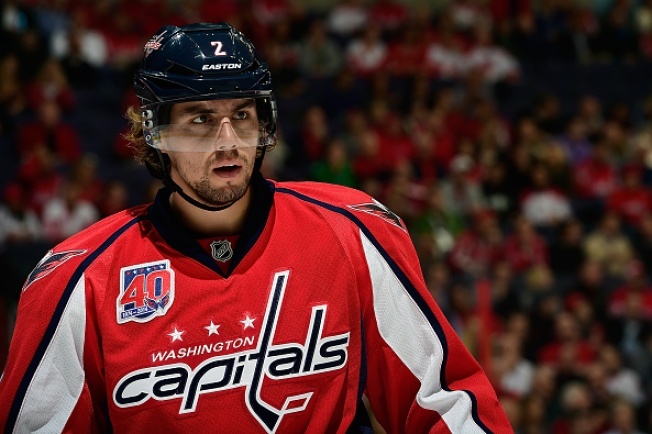 Trotz has been impressed by Niskanen's all-around acumen. With the overall blue-line mobility that the Capitals possess, stick-on-puck should develop into a successful way for all of their defensemen to defend. "I think he's learned that you use the combination of your legs, your stick and your gap or your smarts, angles, all those things," Trotz said of Niskanen. "They come with reps, they come with understanding the game a little more and understanding how moving two feet here, two feet there could make a huge difference in that. That's what he learned. "I think young guys sometimes blow those little details off. Even old guys, guys that aren't catching onto what's really effective, how much it matters to have your stick just on the ice and presenting it and making it more difficult than up around your ears. It's totally different. I think guys realize that's part of enhancing the game, part of getting the puck back, part of transitioning, part of defending and all that. It might sound very minor. It's like the faceoff, how crucial it is in the game to puck possession and starting with it, and doing that, where some people don't put a lot of value into it."